Capping off the week with a new review, New Super Mario Bros. 2 is here in both digital and retail form, and players around the world have already amassed billions upon billions of coins. It's a veritable gold rush. Should you invest some serious coin into this game? Find out with my review. gold standard for the Mario series either. Rehash. That's a popular word for those who don't care for the Mario series and more broadly, Nintendo. Change too little and the game is a rehash. Change too much and the game is ruined. Nintendo constantly has to walk the line between tradition and progress, and their fans will tell them if they stray too far from it. 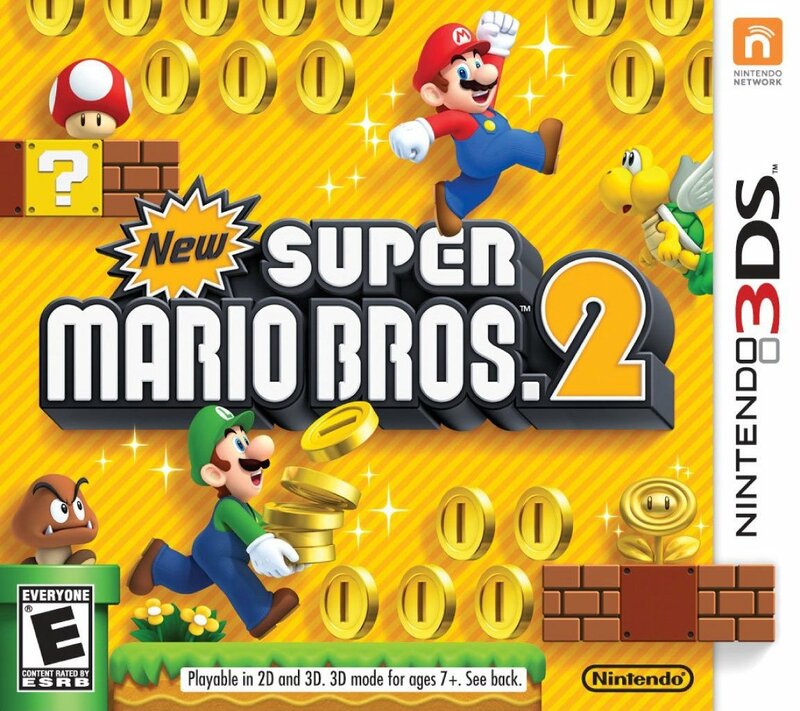 I have mentioned in the past that I considered New Super Mario Bros. 2, the game developed by a team of newcomers who got a crash course on Mario level design, to be the appetizer to New Super Mario Bros. U, the game series veterans are building. Well, after playing New Super Mario Bros. 2 for an extended period of time, if this game is the appetizer, I would love to have seconds. If you have any experience playing an old school Mario game, the moment you boot up New Super Mario Bros. 2 you get waves of nostalgia and a sharp sense of familiarity. Yes, you are indeed playing an all-new 2D Mario. That understanding might not unleash the same power as it normally would because there is another New Super Mario Bros. game in the pipeline for this very year, New Super Mario Bros. U. But then you realize that Nintendo only pushes out one mainline 2D Mario per system, and thus you feel content and ready to play what you believe will be something special. Though, what isn't so special is the reason for this whole grand platforming adventure to begin with. Once again Princess Peach is kidnapped by the Koopa Kids, and it's up to a pudgy plumber to rescue her. See what I'm talking about with regards to familiarity? with simply this standalone screenshot. Regardless, New Super Mario Bros. 2 does not stray too far from the tried and true formula in design. There's still an overworld map that players travel across from left to right. There's still the unfaltering array of world tropes to venture through: grasslands, desert, beach, jungle, winter wonderland, and volcano. Nintendo even blatantly recycled most of the music from New Super Mario Bros. Wii for this 3DS iteration. There's a small (very small) sampling of remixed tracks, but there's is an overwhelming feeling of sameness. So for these reasons I could see a soul who doesn't delve too deeply into New Super Mario Bros. 2 saying that the game is but a mere rehash. Mario is the top man on the totem pole. However, upon closer inspection of the game, you get bewitched and entranced by the level design. 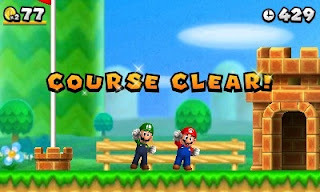 Even with the newcomer team playing through a crash course of Mario games to see how past levels were crafted, they were able to manufacture totally new and fresh ideas into their own designs. 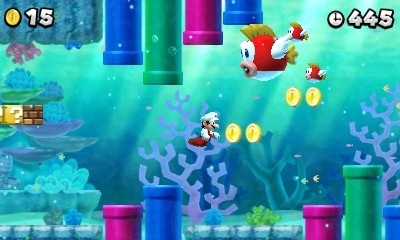 One level has you racing on water in Mini Mushroom Mario form as the screen auto-scrolls. You must dodge urchins and use Paratroopas to get big air. Another level has an enormous, behemoth-sized Boo chasing after you through a ghost house. Then there are ones where you are overcome by a current as you quickly adjust your level in the water to dodge hazards; ones where you ride an undulating Dry Bones boat through a sea of lava, evading fireballs, foes dropping in on you, and other obstacles; and ones where you swim through an underwater tower where spiked pillars and boned fish wish to make your journey difficult. 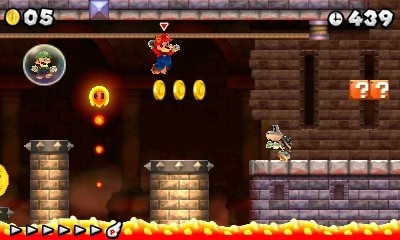 A new level type exclusive to New Super Mario Bros. 2 are short cannon levels. These have Mario constantly running forward with no opportunity to stop, as he uses enemies to leap off of to cross deadly chasms. Think of them as the mach speed sections in Sonic the Hedgehog (2006), except they're in 2D, are less agonizing, much shorter, and they aren't absolutely broken. These levels are found through secret exits scattered around the game (and there's plenty of them to find). You can beat New Super Mario Bros. 2 with just playing through the six standard worlds. However, by finding the secret levels in various levels, you can get to the aforementioned cannon stages which can take you to two special non-themed worlds. There's even a final world after beating New Super Mario Bros. 2 that houses the most challenging levels in the game, making the total worlds of the game nine. Discovering the quite crafty in location secret exits isn't the only optional task persistent perfectionist players can attempt. No, like the prior two games in the New Super Mario Bros. line, there are three Star Coins per level that are placed in precarious spots and hidden throughout. These will take all your cunning and ability to find them. My only problem with the sites of some is that they require you to hit invisible blocks which grow beanstalks. In fact, the new blood of developers on this title seem to have a penchant and over-reliance on them. Nonetheless, Star Coins not only are a requirement to getting a star on your save file, but they also unlock overworld map paths leading to new areas, Toad Houses, and levels. from pipes, from blocks, from foes, etc. 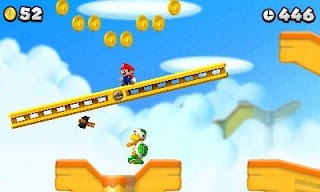 In the months leading up to the release of New Super Mario Bros. 2, Nintendo hyped up the ability to collect coins and how coins would come out of every orifice, corner, and angle of the game's many levels. Gold coins are everywhere. Gold rings temporarily turn every enemy into a gold version of themselves. Grabbing a golden Koopa shell and tossing it will have it leave a trail of golden goodness for Mario to follow. Jumping off the heads of enemies in golden form will give Mario even more coins. 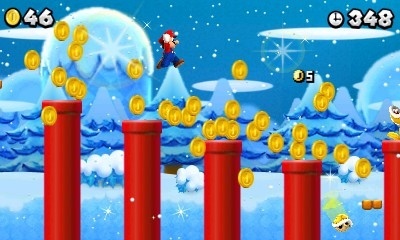 Chucking fireballs as Fire Mario into certain pipes will blast countless coins into the air for Mario to collect. 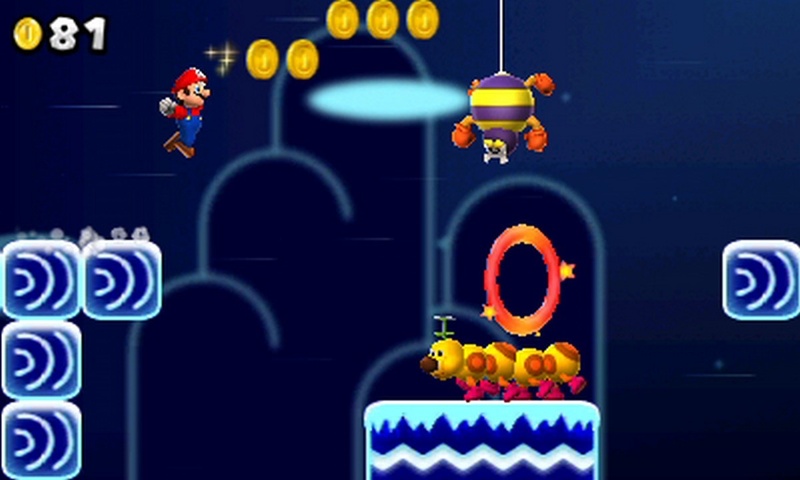 There are even big golden blocks that act as a roulette wheel, and hitting them can earn Mario up to fifty coins. To continue the crazy coin-age, occasionally there are brick blocks that can be jumped into ten times, covering Mario's head in a gold block. As he runs, he amasses a myriad of coins. And along with the return of the awesome Raccoon Mario power-up, Mario can grab a Gold Flower and fire golden fireballs with the ability to give him mad coin-age for every foe he hits and block he busts. Mario goes for gold with this new power-up. With all these coins to nab, you can imagine that Mario will be racking up lives. This is indeed the case, making lives feel pretty useless. However, collecting the max amount is one of the requirements for getting five stars on your save file. Even with the threat of losing lives not that big of a concern, you might think that there's no fear at all to be had about dying. Unlike lots of coins giving out lots of lives, that certainly is not the case. If Mario dies five times in a row in a level, a gold block will show up. This block enables you to don a golden raccoon suit, making Mario completely invincible. However, if the block shows up at all, you lose the ability to get all five glittery stars on your save file. That is, you can get five stars but they won't be sparkle. This is a pain in the patootie because even if you don't hit the block, you are still penalized. 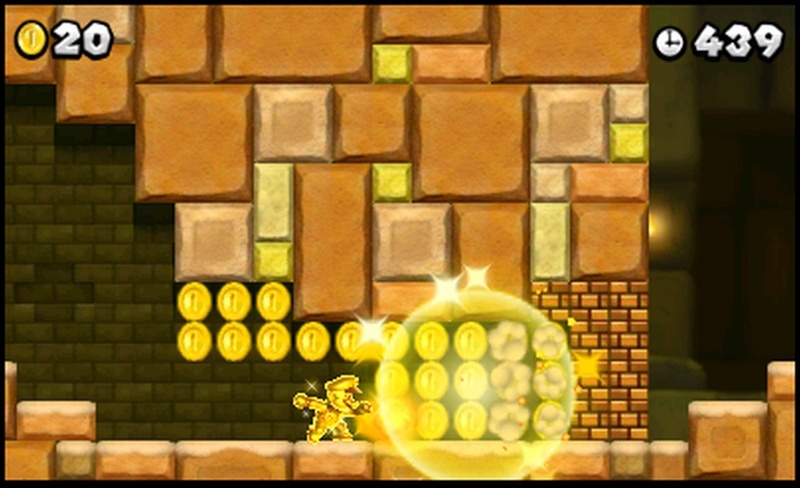 As stated, coins are a big part of the promotion of New Super Mario Bros. 2. They are essentially everywhere in the game. A portion of this shines heavily through the Coin Rush mode. This has you choosing from one of three level packs: Mushroom, Flower, and Star. You then play through a random series of three levels based on which pack you have selected, trying to get the most coins as possible with only one life to live. Your total carries over through each level, and hitting the top of a flagpole doubles your amount completely. This is basically the mode to play for getting to the ever-illusive one million coin objective. Unfortunately, however, the prize for actually doing so is incredibly disappointing and not really worth the effort. Nonetheless, Coin Rush is an absolute blast to play through. I only wish there were SpotPass leaderboards to compare scores with friends, family, and even complete strangers. As it is, you can exchange top scores and challenge other people's runs through StreetPass, a local wireless feature of the Nintendo 3DS. And speaking of local wireless, two players with two 3DS systems and a copy of the game each can play the full game cooperatively. It is not a feature that I could try out myself, but for those with all the necessary provisions, it is there for you to enjoy. team it up with the co-op mode. New Super Mario Bros. 2 isn't a graphical showcase of the hardware it is on. It does not look horrible by any means. It is a competent looking game that runs really well. 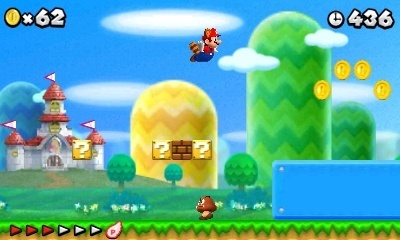 Mario's model compared to New Super Mario Bros. on the DS has been significantly upgraded. Backgrounds are gorgeous (though they blur to create a feeling of depth of field when the 3D slider on the system is turned up). I think the art style of the New Super Mario Bros. series isn't bland at all. It might be sterile, it might be safe (like the game itself), but it is entirely inoffensive. Even the music that has generated a lot of criticism is catchy, regardless of whether or not it reuses melodies and outright steals material from the Wii game. Some have stated that they are losing hope in Nintendo's ability to craft awesome Mario experiences. 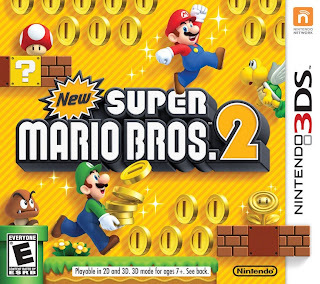 However, with the release of New Super Mario Bros. 2 and playing through it, this game just gives me more hope as it was made by newcomers who had never made a 2D Mario in their life. These beginners have shown that they have the brilliant ability to create a Mario game with ingenuity, supremely creative level design, terrifically tight controls, and interesting ideas in such remarkable ways that I feel the future of the Mario franchise is safe, and more importantly, all the brighter. New Super Mario Bros. 2 isn't the definite gold standard for 2D Mario as it doesn't deviate too far from the protected formula (and I wish it would start), but with some more fine-honing of the young men and women behind this game, they could create a generation's Super Mario Bros. 3 or Super Mario World someday. Great, review. Phil. I was hesitant on buying this on launch day, but after reading your thoughts, I think I'll make this baby my next $40 3DS purchase.